One of the groups at South Webster’s Health Fair last year. What does one think of when they hear about a health fair? Screenings, tests, hospitals, good health habits, ambulances, and many other health related things that could be there. 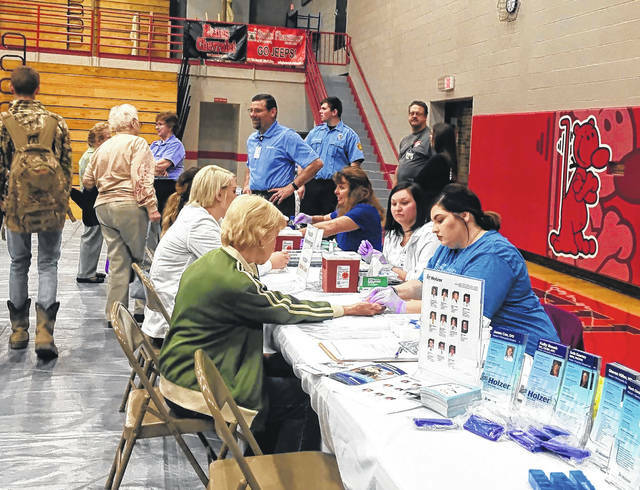 This year’s South Webster High School’s annual Health Fair will have all of that and much more, on April 17. The health fair is having a blood drive, coordinated with the health fair. The fair is always on the third Wednesday of April because it is when the local 55 club meets. Both the Bloom and Vernon 55 Club are a very big part of the fair. The school provides the 55 Club as well as any of the groups that set up that day lunch. As for the blood drive, they had 63 spots and at this time, there were only three openings left, to give blood. Barnett has been working for the event all of its 29 years. He usually starts calling people to come out in early March and says a lot of them are repeats, so they know all about the health fair. He says they do have a few new groups setting up. This health fair began as an outreach of the Community Education Program and he worked then, with Jerry and Vicki Evans and it was thought of in order to bring out awareness that good health is very essential. Barnett says that King’s Daughters has been great to work with and they come in at 9:00 a.m. to work with the employees only first, where they do blood pressures, blood sugars, total cholesterol screens, and EKG’s from 9:00 to 10:00 a.m. and then the community can get the same during the regular hours of the health fair. King’s Daughters is also bringing their mammography bus out and that schedule is already full. Katie Allard, the South Webster School Nurse, coordinates this. The local fire and EMS come in and stress community helpers. Vernon and Bloom work together providing for the primary students to see the vehicles they use inside and out so they can see that when these vehicles like an ambulance, are there to help, not to scare. “We will have what varies to approximately 700 students in the gymnasium, plus the two to three hundred from the community to attend,” . People seem to come from all around.” Barnett said. He added the administration at Bloom Vernon Schools have been phenomenal to work with. “We encourage people to take advantage of the free services that are available on that day”. They have had the State Highway Patrol and the sheriff’s office represented at the fair. Brandie Zimmerman is the person who works with the American Red Cross to make sure the blood drive is taken care of at the fair and the other times they have a blood drive there at the school. The list of other groups that will be there at the Fair besides the five hospitals are: The ADAMHS Board, Alternative Nursing and Homecare, American Red Cross, Area Agency on Aging, The Autism Group, Bestcare, Children’s Services, Community Action, Workforce Development, Social Services, Head Start, Energy Assistance, Cradle, Community Choice, Deaf Services, Domestic Violence, Sandy Cable with the massage chair, ,Heartland Hospice, Lifeline of Ohio, Opportunities for Ohioans with Disabilities, Port 45 Recovery, Potter’s House, Scioto County Development Disabilities, Scioto County Career Center to talk about health care opportunities, Shawnee State and University of Rio Grande, County and City Health Departments, the Sheriff’s Department, Educational Service Center, Sexual Assult Treatment Center, Shawnee Family Heath, Smith’s Pharmacy, Senior Games, We Care Medical, and the State Highway Patrol. The Health Fair may not be what you think of as fun, but there are a lot of things to come see and do, and to help people take care of their health needs.